Located in the western region of Ladakh, amidst mountain backed badlands, is one of the most popular villages and an ideal stopover between the Kargil-Leh route. 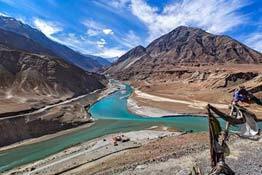 It is situated around 127 kilometers from the town of Leh. 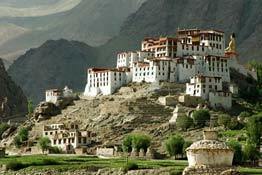 Tourists who visit Ladakh halts in Lamayuru as a rule to visit Lamayuru monastery in this region. Dating back to the 11th century, Lamayuru monastery was founded by Mahasiddhacharya Naropa and belongs to Red-Hat sect of Buddhism. Also known as Yung-Drung, this monastery is home to more than 150 monks and houses a rich collection of artifacts, wall paintings, thangas, statues, carpets and an impressive 11-headed, 1000 eyed image of Chenzing. Apart from the monastery, Lamayuru also attracts tourists for its beautiful landscape which is quite similar to the lunar territory. Although it's quite remote, it is a favorite jaunt for photographers and trekkers. In order to reach Lamayuru, one has to travel 107 kilometers west from Leh. Either you can take a short bypass from the nearby Srinagar-Leh road or set off on a trail to the Prikiti-La pass- the gateway to Zanskar. June to September is the best time to visit Lamayuru as the roads are clear and bereft of snow. The history of Lamayuru monastery dates back to the 10th century, when the Indian scholar Mahasiddhacharya Naropa caused a lake to dry up, which fed up the entire valley, and laid the foundation stone of Lamayuru monastery. 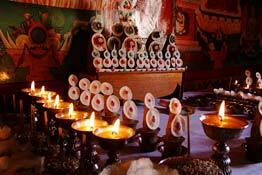 There is an oldest surviving temple in Lamayuru called Seng-ge-sgang, located at the southern end of the monastery. Besides the monastery itself, Lamayuru is quite well known for Yuru Kabgyat. It is a two-day festival and one of the biggest in Ladakh's cultural calendar. During the festival, masked dancers perform the essential teachings of Tibetan Buddhism through traditional dance performances. The prime attraction of these dance dramas includes the demolition of a statue suggesting the enemy inside every individual. The natives of the village turn up in ethnic garments and make the festival more and more colorful. Lamayuru plays host to two annual festivals- Yuru Kab-gyat and Hemis Tse Chu- in the 2nd and 5th month of the Tibetan lunar calendar. Hemis Tse Chu is a two day long festival and the biggest monastic festival in Ladakh. Dedicated to Guru Padmasambhava, the founder of Tantric Buddhism, this festival aims at taming, conversion and integration of Bon-PO gods and demons in Buddhist temples as guardian divinities. The second festival is Yuru Kab-gyat, which is a two day extravaganza of sacred dances and rituals performed by the holy monks. They wear masks and represents guardian divinities. There are several mid-range hotels located nearby the monastery. If you are running on a shoe-string budget, you can stay in the monastery as well. 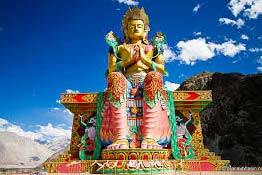 Lamayuru is located 107 kilometers west of Leh, which is quite far. There is a regular bus service from Leh and Kargil, which departs at 10 am in the morning and 12 pm in the afternoon.